Proactive Intelligence | Your site for insight into competitive intelligence. Built for the manager and executive of for profit and non-profit enterprises. This blog is your place to learn about competitive intelligence (CI), even, no especially if you are not a CI professional. I want this to be a place where you can learn about CI to enhance your career and improve your business. While we focus on helping the DIYers (do-it-yourself) in CI, the fastest growing part of CI, I hope it is useful to all interested in CI, whether you do it full-time, part-time, are a student or a DIYer, or are just interested in CI. Who am I? My name is John McGonagle, and I have been involved with CI for over 30 years. I have won major awards for CI, lectured and trained in over a dozen countries, consulted for large and small enterprises, and, with my partner, Carolyn Vella, am the most published author on CI. We are proud to announce the publication of a new book, released July 31, 2017. 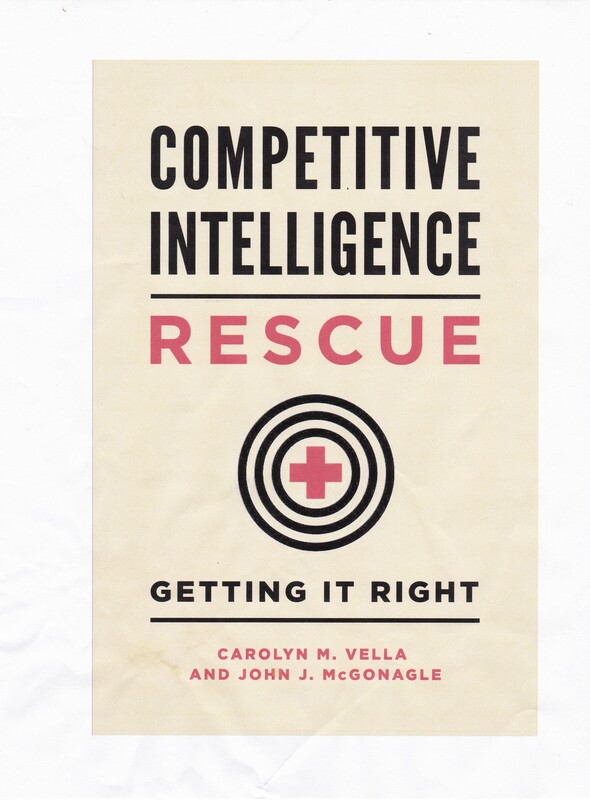 Titled Competitive Intelligence Rescue: Getting It Right, it advances our efforts to make sure that CI is done right the first time by providing access to real cases (edited to protect the clients) and seeing how CI programs are done poorly and can be fixed to be done well. Our previous book, Proactive Intelligence: The Successful Executive’s Guide to Intelligence, was the first step in our effort to bring CI to every manager and executive, whether in marketing, sales, planning,strategy, law, accounting, or human resources. And we know it is a tool that can be used by all enterprises, from the very smallest law office to the largest business or corporation. NOTICE: Unless otherwise specifically noted, all material not in quotations is Copyright by The Helicon Group, John J. McGonagle and/or Carolyn M. Vella. Any reproduction or republication without our written consent, except in another blog giving full credit, is expressively prohibited.